Carabao has been around for 17 years and has finally made its way to Australian shores. 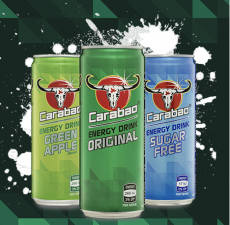 Hot off the heels of global sponsorship deals, Carabao Energy drink has recently had its soft launch in 2018 across the country and is now gearing up to on the energy drink space in 2019 with the low sugar beverage. Carabao has seen consistent global growth and brand recognition. Currently stocked in OTR, Drakes, Spar, Metro Petrol Stations, many independent petrol stations convenience stores and selected BPs Carabao is continuing its rapid growth and looking to add to the 1000+ stores stocking the three flavours: Original, Sugar Free and the most popular Green Apple. Carabao is everything its founders believe in, the official energy drink of the everyday hustle.